There are many reasons that we decided to celebrate Christmas in Granada, Spain. Picturesque white washed homes and scenic vistas, the burbling fountains of the Alhambra, and copious tapas and sweet wine are just a few of the things in store when you travel to Granada for the holiday season. 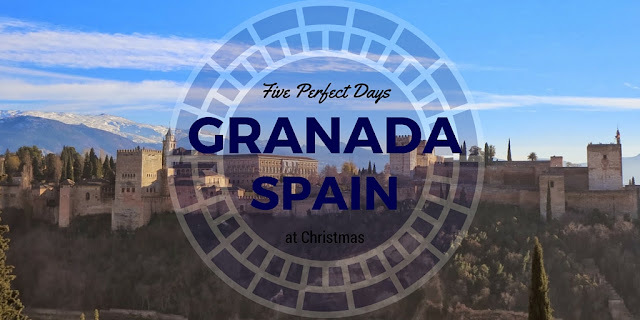 The opportunity to get some much needed sun combined with rumors of glittering lights and holiday cheer led us to book our Christmas trip to Granada for 5 days. In this post, I’ll share the itinerary we created for ourselves for a relaxing Christmas break in Spain. 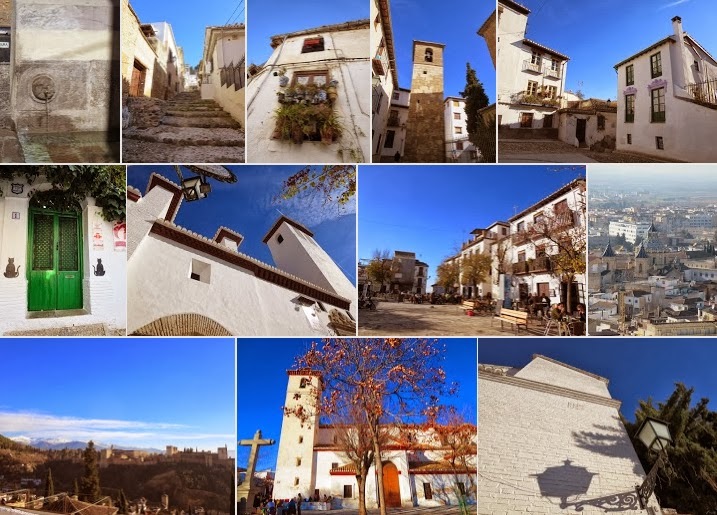 We hope you find it useful if you’re planning your own trip to Granada around the winter holidays. Getting There: Málaga is a convenient starting point for a trip to Granada. Málaga is served by a wide range of airlines including low cost stalwarts like Ryanair and EasyJet. Ground Transportation: Take the train from the airport to Maria Zambrano Station (~10 minutes). From here, cross the street to the bus station. Alsa offers frequent bus service to Granada. Depending on your flight time, you may also be able to catch the less frequent bus service directly from the airport. The journey from Málaga to Granada takes less than two hours. Accommodation: We stayed in a touristic apartment at the comfortable and centrally located Suites Gran Via 44. Our apartment included a small kitchen (important for Christmas Eve/Day when many shops and restaurants are closed). Explore Plaza Nueva and the surrounding area in the late afternoon when the buildings are drenched in golden light. Count the pomegranates: The pomegranate is the symbol of the city of Granada. As you're walking around town, see how many pomegranates you can spot. Admire the holiday lights: After the sun goes down, take a stroll and admire the Christmas lights strung along the main streets and squares. The effect is truly magical. If you're going to be in Granada for a few days or more, it's fun to pretend to be a local and try some out of the way places to eat and drink. Olympia 21: Conveniently located on Calle Gran Via Colon, Olympia 21 offers a dizzying array of sweets; the perfect accompaniment to a cup of coffee taken standing at the counter. We sampled piononos here (kind of a cross between angelfood cake and creme brûlée) which were amazing! Cafe Tramezzini: The locals seem to disappear off the streets in the early evening. Where do they go?...for churros y chocolate of course! The service at Cafe Tramezzini was slow which was understandable given the crowds that had descended on the place but it was worth the wait when we were presented with a thick cup of chocolate and crispy churros fresh from the fryer. Bar Alhambra: Tapas are a staple here in Granada. We tried Bar Alhambra, a higher end tapas bar. The place was so crowded that we had to sit outside under a heat lamp. Still, we enjoyed delicious croquetas and other tapas favorites. Kanela: At the other end of the spectrum, we tried Kanela, a 'hole in the wall' place near Elvira Gate. For 2 euros, we were treated to a quiet caña (small glass of local beer) and a free tapa. The local atmosphere was priceless. The Albayzin neighborhood of Granada rises above the city centre. The climb is quite steep but it's totally worth it for the sweeping views you're rewarded with at the top. We recommend 'getting lost' and exploring some of the small streets and alleys that define the neighborhood. Here's an outline of the route we traced if you need some inspiration to get started. Dining al fresco on Placeta de San Miguel: We were lured in by the value-for-money Menu del Dia offered at Rincon de la Aurora. The 3 course meal somehow tasted even better when splashed with ample amounts of sunshine on the square. Mirador San Nicolás: We marveled at the spectacular views of the iconic Alhambra from Mirador San Nicolás. Bodegas La Mancha: Let gravity help you descend from the Albayzin and onto Calle Joaquin Costa for a post walk reward of tapas and vermut. No trip to Granada is complete without a trip to the Alhambra, Spain's #1 tourist attraction. The Moorish palace and stronghold before the reconquista requires a full day to do it justice. Walk up from town: After the walk to the Albayzin the day before, your legs should be conditioned to do a bit of climbing. 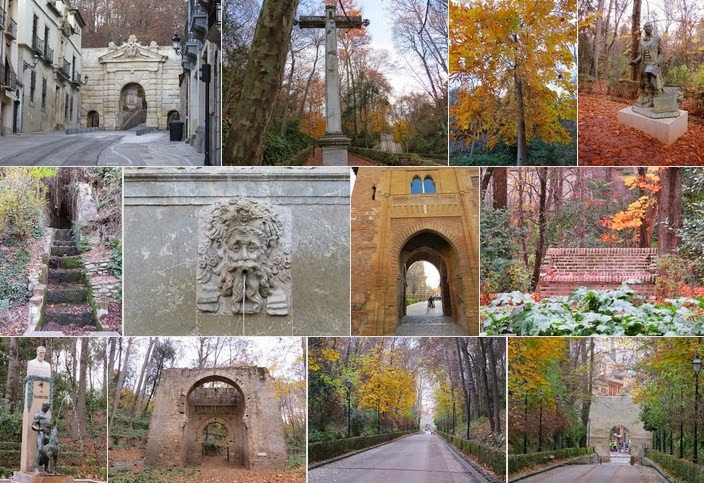 A lovely 30 minute hike along a forested path will deposit you at the gate of the Alhambra palace complex. Tip: buy your ticket in advance online and pick it up at the Tienda de la Alhambra (Alhambra Shop) on Calle Reyes Católicos nº 40 to avoid disappointment as the Alhambra hosts a limited number of visitors each day. Alcazaba: Check out the views of Mirador San Nicolás where you stood the previous day from this crumbling fortification at the edge of the Alhambra complex. Nasrid Palaces: Make sure to arrive in time for your timed entry to the Nasrid Palace, the highlight of the Alhambra. Admire the Moorish textures, windows, and fountains. Carlos V Palace: Take a quick spin through Carlos V's unfinished Palace and pop into the Museum of the Alhambra which features a variety of artefacts tied to the site. Tip: Check the weather forecast and bring gloves and a hat. The weather was very cold when we visited in late December. The Museum of the Alhambra is one of a very few places on site where you can get inside to warm up. Most of the buildings (including the Nasrid Palaces are open-air). 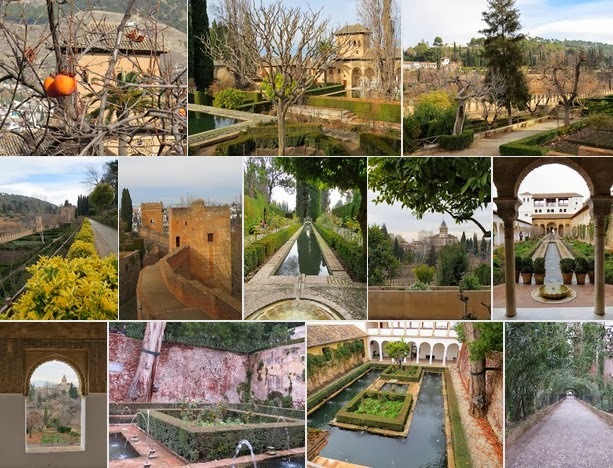 Fountains and Gardens: Give yourself plenty of time to stroll through the fountains and gardens in the wider Alhambra complex including the Jardines del Partal and Jardines del Generalife. The atmosphere is very relaxing. We took some time to listen to the gentle sounds of the fountains, do a bit of birdwatching, and marvel at the breathtaking views over Granada below. Granada shuts down for Christmas in the late afternoon of December 24th (Christmas Eve). Shops are restaurants are generally closed until at least evening time on December 25th (Christmas Day). Lay in supplies: Visit Cortes Ingles and at least one local bakery to buy a few sweet treats for a bit of holiday indulgence. We tried Rey Fernando (yum!). Plan for a quiet day at your hotel relaxing and recovering from all that walking and exploring! Restaurante Poetas Andaluces II: Working through the staff at our hotel, we managed to secure a reservation at a local asador for the late evening on Christmas Day. Christmas cheer apparently transcends language. The waitstaff at the restaurant didn't speak English and we spoke very little Spanish. Still, we managed to communicate through miming and broken sentences and had a delicious meal which culminated in a complimentary glass of local liqueur to toast the holiday and an amazing trip! We hope you've enjoyed our recommendations for a Christmas city break in Granada, Spain. We'd love to hear from you about your own holiday experiences in Granada - please drop us a comment below with your favorite places in Granada. You can also click on any of the photo collages above to see full sized images on Google Plus. 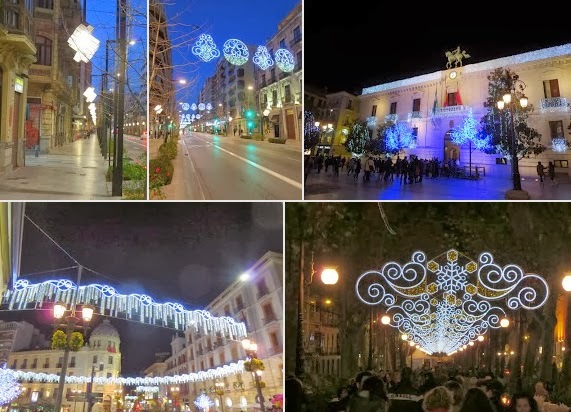 Read on to learn more about how we celebrated New Year's Eve in Malaga with a 1-week itinerary. Granada Christmas Trip Dates: December 22 - 26, 2013 Note: All expenses for the trip were incurred by the author. None of the elements of the trip were sponsored by any of the attractions, hotels, or restaurants referenced. 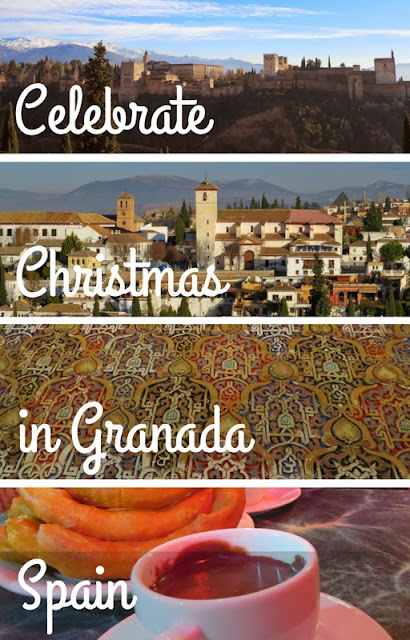 Check out a 5-day independently organized itinerary to spend Christmas in Granada, Spain. Written by Dublin-based travel blogger, Jennifer (aka Dr. J) of Sidewalk Safari.